My father called me Huckleberry. It was probably because I was a tow-haired little man, always getting into trouble, never slowing down and never, ever stopping talking. The nickname was a father’s show of love, but I always hated it. To me, Huckleberry was another word for “yokel” or “hilljack.” I was simply too insecure or took myself way too seriously to accept my dad’s gift. So I took Huckleberry and buried it deeply, like a painful childhood memory. When you hike the Appalachian Trail, everyone takes on a new identity. You trade in Steve or Mark or Evelyn for a trail name. You could be Firegod for nearly burning down a lean-to at dinnertime. Perhaps you are Sticks because you’re always carrying twigs as fuel for your Emberlit stove. You might become Hotpants for catching your clothing on fire while drying it after a downpour. Or you are Crusty Tissues — even I don’t want to hear that story. Maybe you’re Oklahoma because you come from … OK, you get the point. Most hikers I have met who are walking all the way from Maine to Georgia (or Georgia to Maine) frown on those who name themselves. “That’s not how it’s done,” a guy named Kick-it said. “You cannot pick your own name.” I am one of those people who broke that rule, and try as they might, I’m not giving back Huckleberry Finch. 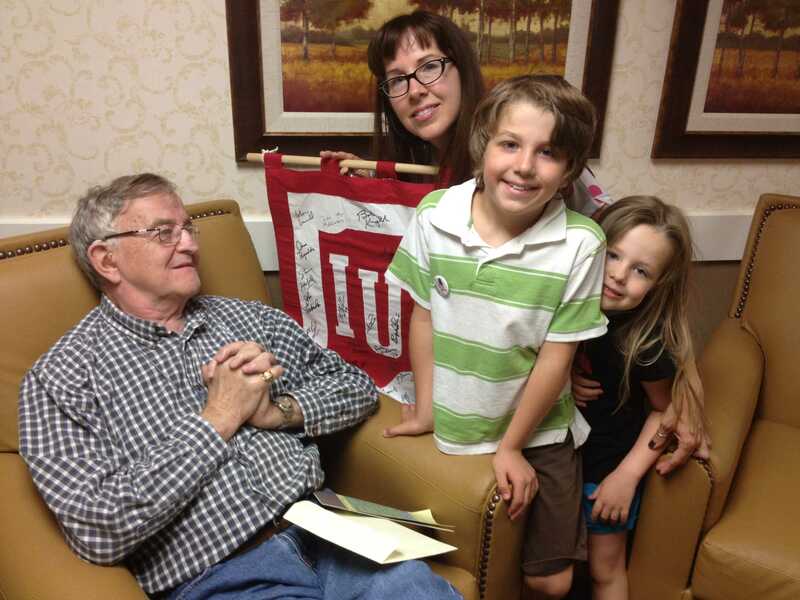 On Father’s Day 2012, my family took my dad an Indiana University flag stitched by his wife, Jane. She had given me this wall hanging so I could have it autographed by IU basketball legends gathered for a reunion in Indianapolis. My father grew up a Cleveland Indians fan who traded in his childhood team for the Reds when we lived north of Cincinnati in the 1980s, and he stopped following baseball when Pete Rose was banned for life. Dad loved the Cleveland Browns as a kid but became a Jacksonville Jaguars diehard when he and my mom became season ticket holders during the franchise’s first eight seasons in their adopted hometown. Only one team was a lifelong sports obsession: his alma mater, Indiana University. Dad loved IU basketball and IU football. No other sports came close. On his Father’s Day flag were the signatures of Hall of Fame coach Bob Knight, then-New York Knicks coach Mike Woodson, Big Ten scoring king Calbert Cheaney, Jay Edwards, Steve Downing, Ted Kitchel and scores of other Hoosiers legends. I was the proud son that day. We could tell that our boy was unnerved by the attention. “Do you know why Grandpa kept staring at you, Forrest?” my wife, Shanna, asked. He shrugged. “He thinks you are Huckleberry.” My children had no idea my father had ever called me such a name, and they wouldn’t unless they’d overheard him say it — no, that’s not right — he would sing it to me when he saw me. “Huckleberr-eeeeeeeeeeee!” In my 40s, I still hated that stupid nickname. As a hiking rookie, I try to limit my mistakes. I attempt to leave no trace, packing out all my trash and picking up after others where I can. I stick to approved campsites. I do what I can to be a good citizen of the hiker community. I have broken one rule, violated one protocol: I named myself. I took a name I once hated and finally — after 40some years — embraced it. I paired another of my favorite figures in literature, Ol’ Atticus Finch, with Huckleberry Finn. And now whenever someone calls me Huckleberry, I think of my dad. I miss so much when I am out in the woods. I long for a shower, a steak, clean clothes, a beer. I dream of tacos and friends and family, movies and books, my Chicago Cubs. But besides my children, there is nothing in this universe I miss more than my dad. He was quite simply one helluva good man. Stay on it! I’m excited to hear about your travels. I miss him, too. I do feel much closer to him out here, though.